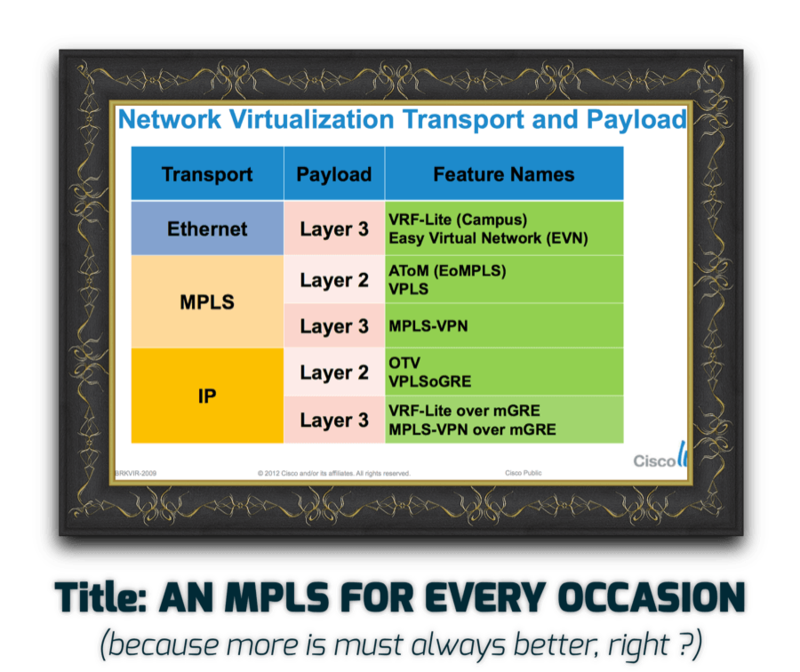 The only items in the chart that are *MPLS* are l3vpn, l2vpn and vpls, the rest are just virtulization technologies that are mpls like. The fact that someone chose to offer a similar capability using gre and not ldp/tdp/RSVP doesn’t make it mpls. Vrf-lite again isn’t mpls but has many use cases where someone needs to partition ip space/routes in a couple of devices and it does so simply and effectively. I think that all the similar tech is flattering to the mpls suite of offerings because it shows just how useful they are. If we want to go out on a limb, why don’t we call l2tpv3 another mpls protocol (l2vpn) and I can make the slide even longer (and incorrect). I love all networking. Some parts I love a little bit less though.